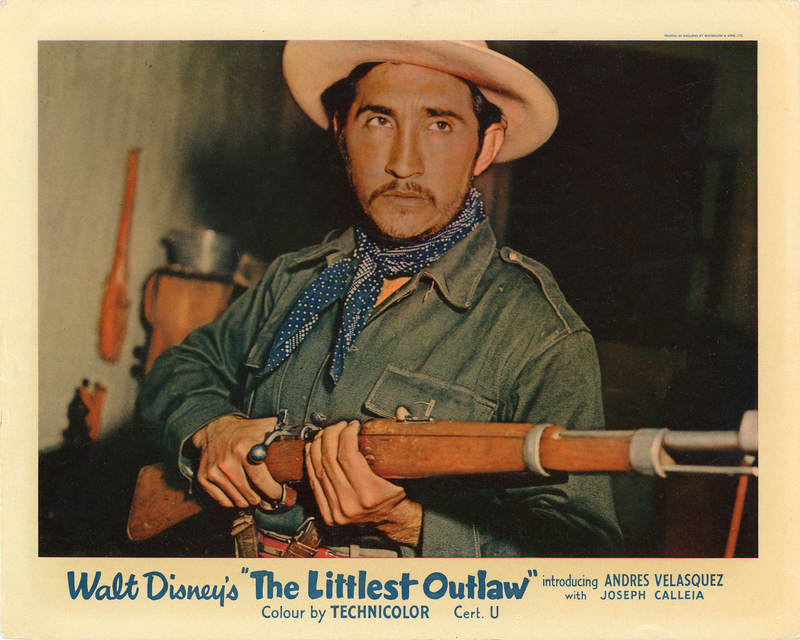 SCVHistory.com LW3330 | Film-Arts | Rodolfo Acosta in 'The Littlest Outlaw' (Disney 1955), British Lobby Card. Rodolfo Acosta in "The Littlest Outlaw"
Rodolfo Acosta in "The Littlest Outlaw," the story of a boy, played by Andrés Velázquez (as Andres Velasquez), and his horse, from Walt Disney Productions, 1955. British lobby card, 8x10 inches (standard size for Great Britain). Filmed in Mexico. Lobby card printed in England by Waterlow & Sons Ltd. and distributed by Girosign Ltd. of London (86-88 Wardour Street), a supplier of advertising materials for the movies. "Cert. U" means the film received a "U" (Universal) rating from the British Board of Film Classification, the equivalent of a "G" (General Audiences) rating in the United States. Walt Disney had an extensive history of filming in Mexico, starting in 1941 when he was selected to join a group of artists traveling throughout Latin American with President Franklin D. Roosevelt's Good Neighbor Program. Disney memorialized the trip with the 1942 film, "Saludos Amigos," and returned to Mexico later that year to start work on "The Three Caballeros." In 1943 Disney and MGM's Louis B. Mayer received the Order of the Aztec Eagle from Mexican President Manuel Ávila Camacho — the highest honor a foreigner could receive. Disney made many more movies in Mexico over the next two decades (until his death in 1966) and received many more honors along the way, including the Onix Award of Merit from the Ibero-American University's Institute of Cinema Culture. The tradition continues into the 21st Century with films such as the Academy Award winner "Coco" (2017), which was co-directed by Adrian Molina, a 2007 graduate of The Walt Disney Co.'s Valencia "feeder school," CalArts. "The Littlest Outlaw" was filmed in Guanajuato, San Miguel de Allende and Querétaro. Top billing went to Pedro Armendáriz (co-star of John Ford's "3 Godfathers" with John Wayne and Harry Carey Jr.) and the Italian (actually Maltese) heavy Joseph Calleia ("After the Thin Man," "For Whom the Bell Tolls," "The Jungle Book"). Also featured: Laila Maley, Pepe Ortiz, Gilberto González, José Torvay, Jorge Treviño, José Ángel Espinosa, Enriqueta Zazueta, Irving Lee, Carlos Ortigoza, Margarito Luna, Ricardo Gonzáles and Eulalio González. Uncredited cast includes María Eugenia and Pedrito Vargas. Mexican-American screen actor Rodolfo "Rudy" Acosta (1920-1974) was inducted posthumously into the Newhall Walk of Western Stars in 2013. He is the father of Santa Clarita Assemblyman Dante Acosta (who also has his SAG card). 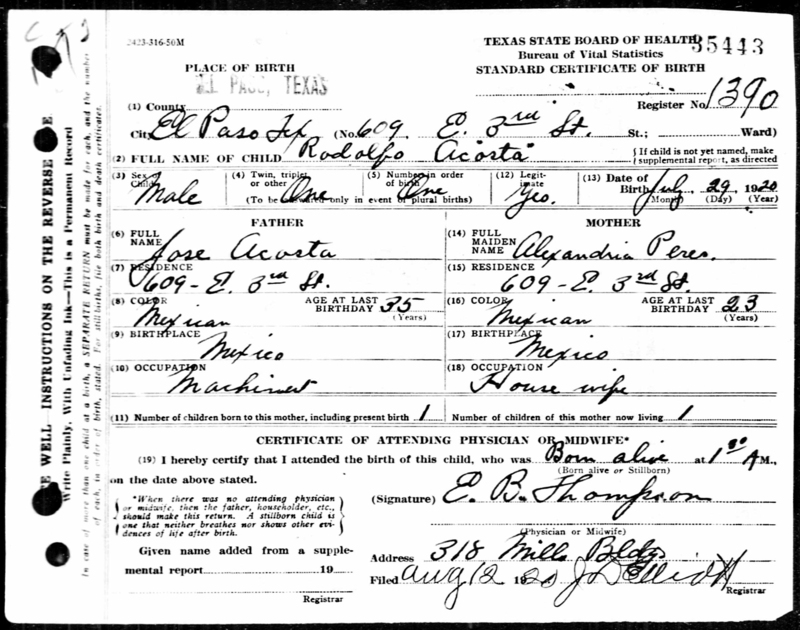 According to his Texas birth certificate, Rodolfo entered the world as a U.S. citizen on July 29, 1920. He was born in the family home at 609 E. 3rd Avenue in El Paso's El Segundo Barrio, the city's second-oldest neighborhood and an arrival point since the 1880s for Mexican immigrants crossing the Rio Grande through Ciudad Juarez. Both parents hailed from Mexico: José Acosta (aka Joseph R.), a machinist, and his wife, Alexandria Perez (aka Alejandrina). According to anthology authors Luis Reyes and Peter Rubie, "When [Rodolfo] was three years old, his family moved to California, where he attended Los Angeles City College and UCLA." 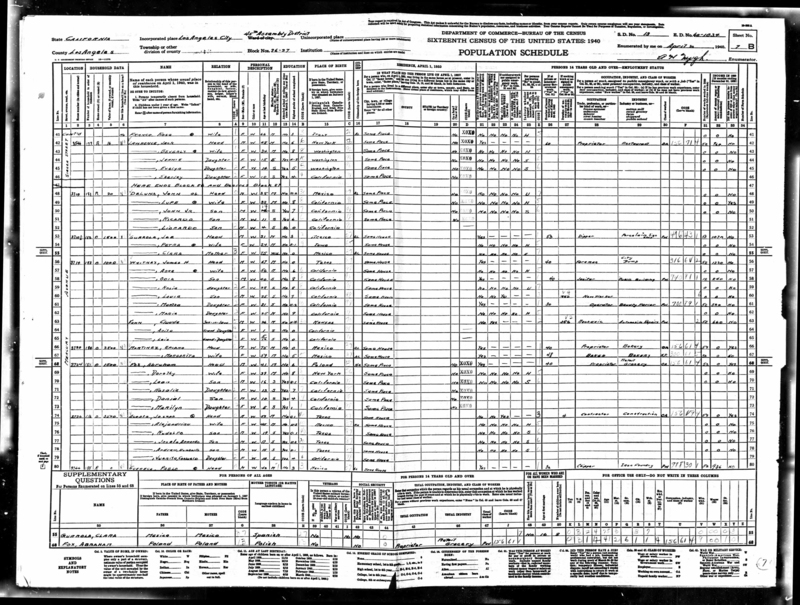 The 1940 U.S. Census shows Rodolfo, the eldest of four children, as a college student living at home with his parents and siblings at 3736 Mercury Avenue in the Montecito Heights section of Los Angeles. There is much erroneous information on and off the Internet about Rodolfo's early years. Some sources incorrectly state he was born in Chihuahua, Mexico; others incorrectly state he was born in the Chamizac section of El Paso, which is actually one barrio to the east. Some falsely claim he attended a Lincoln High School in northern California; in fact, Abraham Lincoln High School was then and is now in Lincoln Heights, right down the road from Montecito Heights. 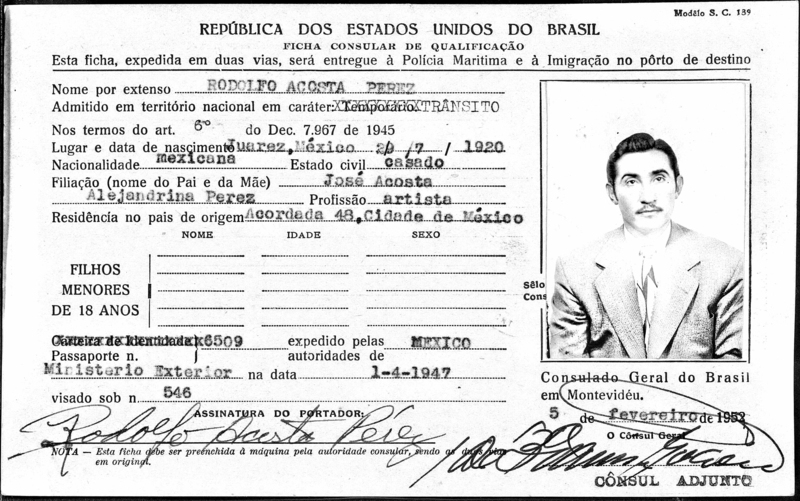 Some say he was born Rodolfo Acosta Perez, and although it's true he used this traditional Mexican naming convention in 1952 when he traveled to Brazil — where his visa states, for whatever reason, that he was born in Ciudad Juarez — his full legal birth name was "Rodolfo Acosta" (NMI). Returning to our timeline, Reyes and Rubie continue: "He was fascinated by acting, studying it at school as well as at the Pasadena Playhouse. His success in dramatic studies reached a peak at age 19 [probably 20] when he accepted a prize scholarship from the Palacio de Bellas Artes in Mexico City, where he stayed for three years." 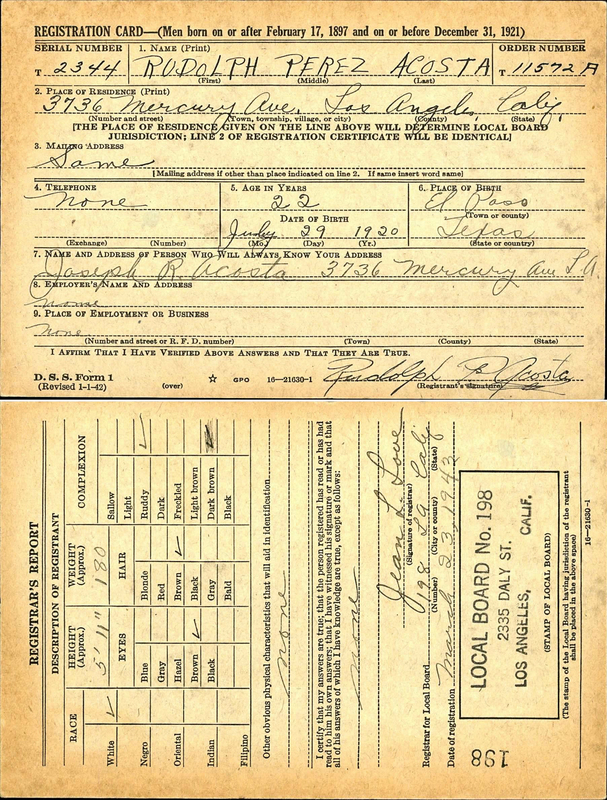 Back in the States in 1943, he used the Mercury Avenue address when he signed his draft card (as Rudolph Perez Acosta) on March 23. He stood 5-feet-11 and weighed 180 pounds. According to Reyes and Rubie, he was assigned to naval intelligence. He reportedly married a woman he met in Casablanca. The union did not last much more than a few years. After the war, he landed a role as one of the minions of the crime boss in the 1946 Spanish-language film, "Soy un Prófugo" ("I Am a Fugitive"), directed by Miguel M. Delgado. How it turned into the John Ford picture of essentially the same name ("The Fugitive") one year later, we don't know, but Ford cast Acosta in it, this time as a policeman, supposedly after seeing him in a stage production. It, too, was filmed in Mexico. Despite a cast headed by Henry Fonda and the top Mexican actors Dolores del Rio and Pedro Armendariz, "The Fugutive" lost $700,000 for RKO. Acosta spent the late 1940s and 1950s going back and forth across the border to play major roles in Mexico and usually smaller roles in the U.S., often as a villain or a heavy. "In 1948, the famous Mexican actor-director Emilio Fernandez wrote for him the role of Paco, a gigolo, in the Mexican film classic Salón México. The part won Acosta Mexico's highest acting award, the Ariel," Reyes and Rubie write. "He was immediately signed by Hugo Fregonese to co-star with James Mason in the 1950 production, 'One Way Street,' which led to a Universal contract." Acosta also went back and forth from the big screen to the small, appearing in "The Big Valley," "Maverick," "Tales of Wells Fargo," "Bonanza" and other TV Westerns in the 1950s and 1960s. One of his most enduring roles was that of Silva, an Apache warrior who tries to kill John Wayne's character in the 1953 John Farrow screen adaptation of Louis L'Amour's "Hondo." Diehard fans of Duke Wayne still resent him for it. A few of the motion pictures and television episodes that featured Acosta were made in the Santa Clarita Valley, such as 1957's "Apache Warrior" from 20th Century-Fox, which used Vasquez Rocks, and the TV series "Zorro" and "Have Gun-Will Travel," which used several SCV locations. A sampling of additional appearances: "One-Eyed Jacks" (1961), "How the West Was Won" (1962), "The Greatest Story Ever Told" (1965), "The Sons of Katie Elder" (1965), "Return of the Magnificent Seven" (1966), "Mission: Impossible" (TV, 1969), "Ironside" (TV, 1971-1973). Acosta succumbed to cancer November 7, 1974, at the Motion Picture Home in Woodland Hills. 1. Reyes, Luis, and Peter Rubie. "Hispanics in Hollywood." Los Angeles: Lone Eagle Publishing Co., 2000. 2. Eyman, Scott. "John Wayne: The Life and Legend." New York: Simon & Schuster 2014. LW3330: 9600 dpi jpeg from original lobby card purchased 2018 by Leon Worden.